Good morning. Welcome back to the Saturday Lecture Series, this morning we will discuss the magnetic fields of Jupiter as brought to us by our friends at spaceweather.com . JUPITER HAS AN EXTRA MAGNETIC POLE: When NASA’s Juno spacecraft reached Jupiter in 2016, planetary scientists were eager to learn more about the giant planet’s magnetic field. Juno would fly over both of Jupiter’s poles, skimming just 4000 km above the cloudtops for measurements at point-blank range. Today in the journal Nature, a team of researchers led by Kimberly Moore of Harvard University announced new results from Juno–and they are weird. Among the findings: Jupiter has an extra magnetic pole. “We find that Jupiter’s magnetic field is different from all other known planetary magnetic fields,” the researchers wrote in the introduction to their paper. The best way to appreciate the strangeness of Jupiter’s magnetic field is by comparison to Earth. Our planet has two well-defined magnetic poles–one in each hemisphere. This is normal. Jupiter’s southern hemisphere looks normal, too. It has a single magnetic pole located near the planet’s spin axis. Jupiter’s northern hemisphere, however, is something else. The north magnetic pole is smeared into a swirl, which some writers have likened to a “ponytail.” And there is a second south pole located near the equator. 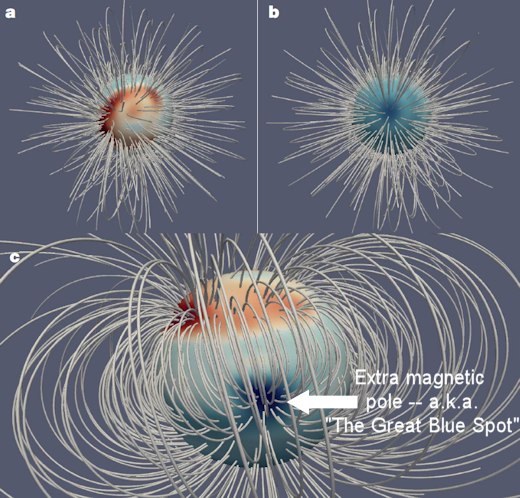 The researchers have dubbed this extra pole “The Great Blue Spot” because it appears blue in their false-color images of magnetic polarity.. In their Nature article, the scientists consider the possibility that we are catching Jupiter in the middle of a magnetic reversal–an unsettled situation with temporary poles popping up in strange places. However, they favor the idea that Jupiter’s inner magnetic dynamo is simply unlike that of other planets. Deep within Jupiter, they posit, liquid metallic hydrogen mixes with partially dissolved rock and ice to create strange electrical currents, giving rise to an equally strange magnetic field. More clues could be in the offing as Juno continues to orbit Jupiter until 2021. Changes to Jupiter’s magnetic structure, for instance, might reveal that a reversal is underway or, conversely, that the extra pole is stable. Stay tuned for updates. This entry was posted on Saturday, September 8th, 2018 at 6:00 am	and is filed under Academia, Astronomy, Science. You can follow any responses to this entry through the RSS 2.0 feed. Both comments and pings are currently closed. Good morning. How many times do you think that Obama mentioned himself in his ridiculous speech yesterday.? Come on take a guess…………..102 Times! This guy has got minority set aside breaks his entire life, including the presidency. He has gone all in with his own fabulousness.Just go away, enough. Stupid researchers. It is impossible for Jupiter to have “three” magnetic poles. Magnetic poles ALWAYS come in pairs. A tri-poled magnetic field means that one of those poles is a Mono-pole, something that mathematically is impossible. Maxwell’s equations make this pretty damned obvious. So, in summation, Jupiter either has 2 poles, or it has 4 poles, or it has 6 poles or 8 poles, but regardless of how many poles it has, they are always an even number. They just don’t know where that 4th pole is yet. My guess is that the “So Called” science writer who wrote this was in a hurry to write something dramatic and didn’t understand electromagnetic theory at all.